The Benjamin Franklin Half Dollar was first introduced in 1948 and was struck by the US Mint through 1963, when it was replaced by the John F. Kennedy Half Dollar. Composed of 90% silver and 10% copper, many were unfortunately melted for their intrinsic value when it rose significantly over the face value. Many of the Franklin Half Dollars survived, however, and are a favorite among collectors. The design was scheduled to run at least another nine years, but was changed by an act of Congress shortly after the assassination of President John Kennedy. Benjamin Franklin is considered one of the founding fathers of the United States. He was a man of many pursuits including science, politics and diplomacy. His influence upon the first years of the country can hardly be over-estimated. The coins were struck at the Mint's facilities in Philadelphia, San Francisco and Denver. 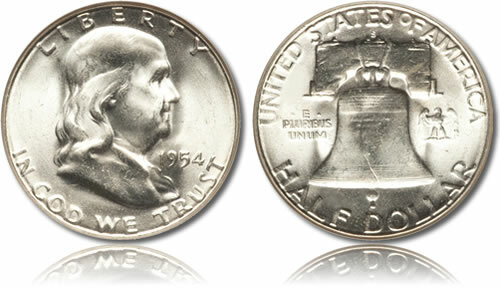 A portrait of Benjamin Franklin designed by John R. Sinnock is featured on the obverse of the coin. Also seen are the inscription "Liberty," "In God We Trust" and the year of mintage. The reverse of the Franklin Half Dollar shows an image of the cracked Liberty Bell with a small eagle to its side, also designed by John R. Sinnock. The inscriptions "United States of America," "Half Dollar," "E Pluribus Unum" and the mintmark, if any, are present as well.